Following two years of development, the CAP desktop series is finally going to market. 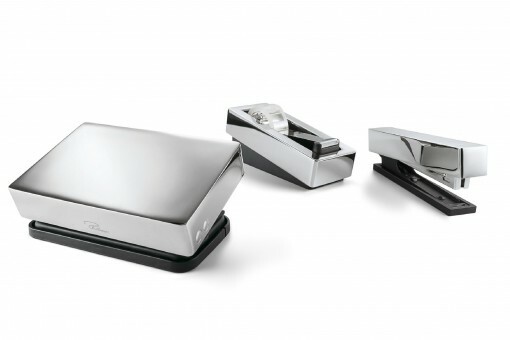 Modeled after a skyline’s silhouette, the hole punch, stapler and tape dispenser lend an especially weighty and yet, subtle elegance to any desktop. 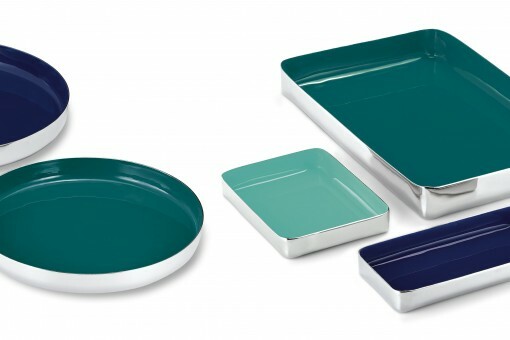 Available in both round and square, the LARGO trays, as a mini-interim collection, define the color shade and fit well into the collection’s style. An exterior of polished stainless steel, enamel on the inside, each piece is handcrafted and thus, unique. AND: 25 Years of PHILIPPI - design en detail, what a beautiful reason to celebrate with our esteemed guests from Germany and around the world. The world’s most unique bollard. 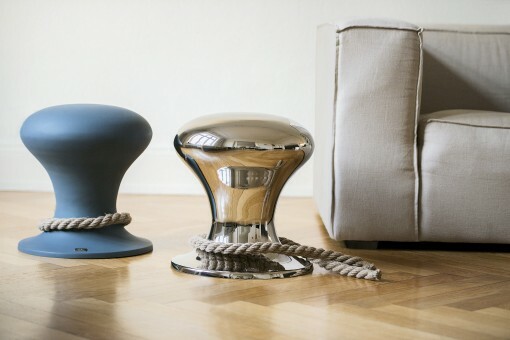 Designer Andreas Ostwald has modeled the HAMBURGER HOCKER (“hocker” is the German word for stool) as a new archetype of those mooring ropes around bollards, on which ships from around the world are made fast to. It stands for new beginnings, commencement and curiosity, for arriving, remaining and slowing down. They are also a tribute to the city of Hamburg and its harbor. 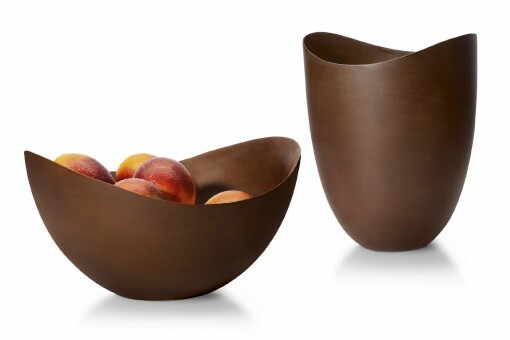 The ORGANIC bowl, made of mango wood, stands as a representative for a new, interesting material in the collection. Besides classic materials of stainless steel, glass and leather, wood brings a warm, homelike touch to it all. COPIC comes along on its filigree legs. However, at the top, is illuminated in its full brilliance. A masterpiece of designer Manfred Jostmeier. SPHERE - born out of a student’s final thesis for the University of the Arts Bremen. Getting the finishing touch in cooperation with our design team. Design fulfils function, function remains design. By Carolin Pertsch as her first designer piece for PHILLIPPI. Finally PHILIPPI celebrates ist 20th anniversary. Driven by this event they relaunch a strictly limited edition of 10 classics which sold well the years before. The family grows. And the candle holder grows with them – BOW. Consisting of individual segments, it becomes arbitrarily expandable. Eight years of developmental work by the designer Prof. Ostwald finally comes to a close: ORBIT – the clock itself turns and a ball, following gravity, substitutes the hands. PHILIPPI has re-invented time. ROCKY MOUNTAIN – a picture frame similar to a sculpture. A collection of 15 hand-sanded acrylic cubes give family photos a brand new look. BURN, the table fireplace can be found in 100,000 households worldwide. Six wicks wind forth through the stones: they shine as they render warmth and a cozy atmosphere. An angel appears. The ANGELO parking ticket holder, invented by the dental technician Eberhard Woike from Kiel in Germany, accompanies you as guardian angel and holds your parking ticket or your little note tight. Apples have a new home now. The COCOON fruit bowl becomes PHILIPPI’s flagship. Practically every magazine publicizes it. A little figurine causes quite a stir: PHILIPPI dares to highlight a kitschy little tumbler called CLAUS at the Frankfurt fair TENDENCE. And behold: PHILIPPI sold almost 70,000 of them! The YAP Mikado is introduced. Jan Philippi likes having those pick-up sticks in color – but how can they be simplified to fit the PHILIPPI image? His grandmother’s knitting needles are his inspiration. In the following year, PHILIPPI wins its first design prize for the game – the #FORM Award 2004. The EXTRAVAGANZA Puzzle Globe is fun for kids. A round-shaped puzzle for all designer tinkers. And PHILIPPI turns 10 and celebrates its anniversary with 100 guests. Jan Philippi discovers the MATZ Frames that are top-sellers in practically all of PHILIPPI’s customers’ stores for almost five years. The SWIRL napkin rings appear in the PHILIPPI catalogue for the very first time. Originally the Moebius strap, Jan Philippi transforms it into napkin rings. AL CUBE, the small card holders make PHILIPPI really big in shops and as a gift. The first edition of the PHILIPPI catalogue goes to press. For cost reasons, the catalogue is printed in a two-tone duplex process. Nature is stylish and the cover is made of kraft paper. The ELLIPSE perfume atomizer is invented. It delights those women who care to refill and stylishly spray their perfumes. Jan Philippi opens two stores in city centre of Hamburg – PHILIPPI Office and living accessories. PACO letter opener is one of the first collection's products – until today more than 100,000 times sold and often copied.